More than 15,000 visitors, over 300 volunteers and 41 exhibitors gathered this past weekend, December 6 and 7, for the open house of the McGill University Health Centre (MUHC) and the Research Institute of the MUHC's new Glen site. It was with great enthusiasm that employees, patients and members of the public discovered their new hospital while enjoying guided tours, entertainment and lots of instructive information provided by our exhibitors and partners. 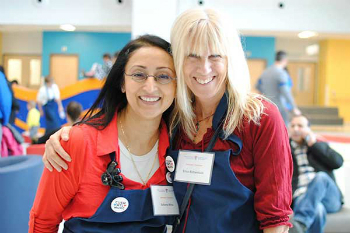 The MUHC wishes to thank the public, its contributors, security, activation and housekeeping teams, as well as all of its volunteers who, with dedication and joy, made this event a great success. A special thank you also goes to our sponsors: Dagwoods, Michaels, Home Depot, JOVIA, Lassonade, La Petite Bretonne, Cidrerie du Minot, St-Viateur Bagels, Danone and Sisca, for their generous contribution. At the MUHC, 2015 will be a year of transformation, innovation and excellence.